We are grown old by listening the brave stories of Jhansi Ki Rani – Rani Lakshmibai. She was a brave queen of Jhansi in North India. She died at the young age of 29 years by fighting with the British rulers in the Indian Rebellion of 1857. She was a very brave queen and refused to give Jhansi state to the British rulers. 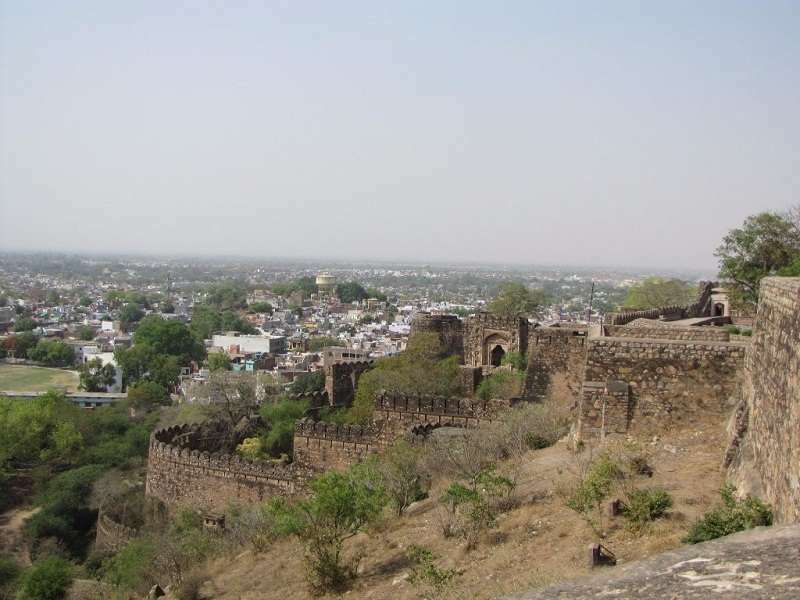 Today we are writing a post on Jhansi Fort which is also known as Jhansi ki Rani ka Kila and Jhansi Ka Qila. Check timings of Jhasni fort, entry fee, location along with address and how to reach. The fort is located at Bangira Hill and it was built by Bir Singh Dev in 1613. It is a 4 century old fort. The fort has 10 entry gates and walls are 15 to 20 feet thick. Shiv Temple, Ganesh Temple, Panch Mahal, Hanging Tower (Phansi Stambh), Amod Bagh, Jumping Spot, Flag Hoisting Point is located in the complex. Various graves are also located here. The fort is spread in an area of 21 acres and it is located at a height of 285 metre. Main fort dimensions are 321 metre and 225 metre. Rani Mahal is also located near the fort and it is converted into Archaeological Museum. 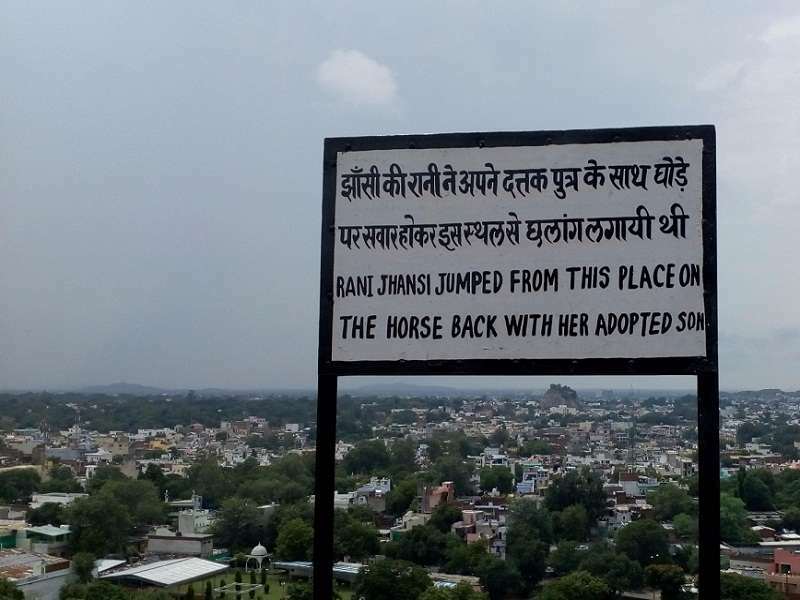 A board is installed near a boundary wall of the fort from where Rani Lakshmi Bai jumped riding with her horse along with her son. Festivals: Grand Jhansi Mahotsav festival is celebrated here and artist from across the country participated in this event and show their art. Fort of Jhansi opening time is 7 AM and closing time is 6 PM in the evening. Jhansi Mahal timings are sunrise to sunset and weekly off is Monday. It remains closed on every Monday. Jhansi Ka Mahal is a ticketed monument and entry tickets are required for the admission in the fort. Indian and foreigner ticket prices are different like most of the monuments of India. Light and sound show is held on regular basis which shows the history of the fort. This show must be attended by visitors in the evening time. Tickets for the show are different than the entry tickets. Detailed tickets prices are written in below Table. The fort is located in the middle of the city and it is most famous landmark of the city. It is just 3 KM from the Jhansi Railway Station. From Jhansi railway station shared Tempo, autos are available to reach here. Jhansi Bus Stand is also 3 KM from here. Jhansi is well connected from all the parts of the country through rail mode. The nearest airport is Gwalior which is around 100 KM from here, however, it has very limited connectivity from the rest of the country. Trains are the best way to reach here, train takes 6 hours to reach here from New Delhi. Below is the Google location map of Jhansi Fort. It is located in the middle of the city and good transport is available to reach here. Washroom, drinking water is available here, along with small parking. Camera is allowed here. Winter months are the best time to visit this fort. Summers are very hot here and the weather is very hot. The temperature can go up to 45 Celsius during the summers. 1 to 2 hour visit is sufficient to visit this fort. It is must visit place in Jhansi and should be visited by every visitor of Jhansi as it shows the bravery of Jhansi Ki Rani who fought with Britishers in young age for the independence of the country. Show is available in two languages for the convenience of visitors. It also show the rich heritage of country and historical importance of Jhansi in India.